The MT Argonon, said to be the world’s first new LNG-fuelled tanker, has been delivered in Rotterdam to Lloyd’s Register class, heralding the start of a new era of cleaner shipping for Europe’s local waterways. The 6,100-dwt dual-fuelled chemical tanker represents a significant milestone for the Deen Shipping subsidiary, Argonon Shipping B.V., in its pursuit of cleaner transport solutions for Europe. Lloyd’s Register helped the owners and regulators to identify their risks, meet regulatory requirements and overcome the technical challenges for the precedent-setting tanker. The dual-fuel system is designed to burn an 80/20 mixture of natural gas and diesel, reducing SOx, NOx and particulate-matter emissions, as well as reducing the greenhouse gas emissions from tank to flue. 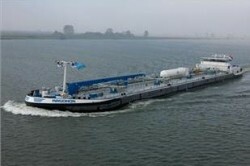 The LNG is stored in a transport tank located on deck, supplied by Cryonorm Projects, based near Amsterdam. Along with Lloyd’s Register, the Netherlands Shipping Inspectorate approved the vessel’s LNG system for operation in the Netherlands and the ship has taken on its first load of LNG bunker fuel. The next step is to secure the regulatory approvals from the Central Commission for Navigating on the Rhine and the UN-ECE ADN Safety Committee, to open the way for navigation beyond the Netherlands. MT Argonon has entered service and will start operating with gas this week following some final, main-engine tests. Built by Rotterdam’s Shipyard Trico B.V., the tanker is 110 metres in length and propelled by two, dual-fuel Caterpillar DF3512 engines, each providing 1,115 KW. The ship has the capacity to transit from Rotterdam to Basel, Switzerland and back without bunkering.